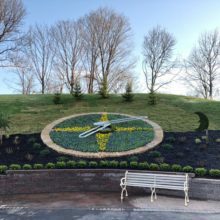 Kansas City’s Worlds of Fun theme park recently introduced their new Americlock botanical floral clock, complete with flower plantings! More than twenty years ago, the Worlds of Fun theme park was home to small floral clock whose diameter measured less than ten feet. 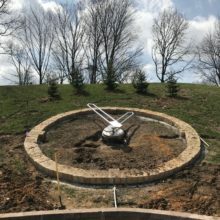 In 2018 Americlock was called upon to produce and install a new 20’ diameter floral clock to replicate the original clock that was removed back in 1996. The garden clock features an “open” hand design (which are also available in a planted hand form factor) showcasing a classic brushed aluminum look on a grassy hillside. Its traditional appearance is contrasted by an accurate GPS-powered time-keeping clock controller technology to help ensure that corrections are automatically made to the special clock’s hour and minute hands. 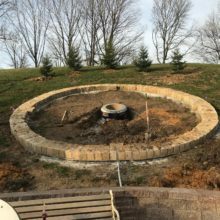 Ahead of the final installation, the team at Americlock sent a concrete form for easy forming. 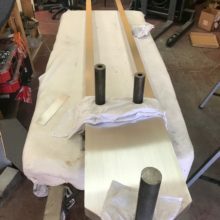 The concrete base supports a large (and heavy) clock motor weighing 250 pounds. The clock features accent flowers that will be changed several times throughout the year, adding a novel look based on seasonally appropriate plantings. Built and installed within three weeks, Americlock is proud to deliver this to visitors of Worlds of Fun!